If you read my story on Aisha Gaddafi and the escape of the brothers and Gaddafi sons, Mohammed and Hannibal, with Gaddafi’s wife Safiya, you should draw the same conclusion that I have. Gaddafi planned to escape to Niger with his family. 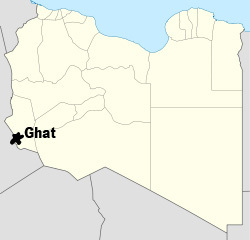 The Algerian governmentÂ thwartedÂ those plans by refusing Gaddafi entry into the country. The only question I have is at which border crossing this happened. Like an earlier article that I wrote on Touregs, it is also obvious to me that Gaddafi is left with hisÂ PraetorianÂ Guard of desert warriors whose loyalty is based on gold. Those are the only loyalists left to him now. That Aisha gave birth deep in the desert at Djanet demonstrates clearly that the Gaddafi family was on its way to Niger. The desert was their last resort — also now thrwarted by the Algerian government which has moved them to Algiers and put them under house arrest. Gaddafi himself is near to that border crossing, in my opinion since he was refused entrance about a week ago. He’s hiding out, protected by the Touregs. I like Ghat, but we’ll soon see. Nice one Sandra – I have been thinking the same. Again.. with Gadaffi, you can never tell.